Each series I create allows for new methods of expression to unfold from performative photography and video, drawing, painting, collage, to installation. 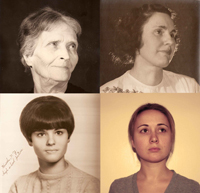 My piece Four Generations consists of four portraits from my matrilineage (clockwise from top right: my great-grandmother, grandmother, mother, and myself). This piece pays homage to the women before me that shaped each other's lives and my own. My artistic concern lies in how culture affects identity. I address how patriarchal gender roles are reinforced through contemporary popular culture. In a world over-saturated with images, it is not a question of, does popular culture affect our lives but; how does mass media affect miniscule to major life decisions we make? Fashion. Body image. Eating disorders. Elective plastic surgery. Gender specific roles such as, wife and bride.